Between 2010 and 2014, CSF-Brazil supported the structuring and development of sustainable businesses in Protected Areas (PAs), such as Indigenous Lands (ILs) and Extractive Reserves (RESEXs). 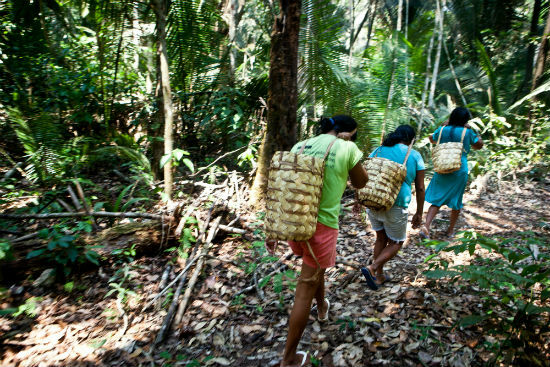 We developed, together with traditional communities, business plans about products such as the Brazil nut, artisanal fresh and salt-water fisheries, timber and ecotourism. These plans sought to identify and strengthen sustainable income alternatives for traditional entrepreneurial peoples and communities. Based on the experiences and results of creating these plans, we developed a working methodology and formalized the steps in this guide. We also held a workshop with professionals and representatives of organizations that support entrepreneurial initiatives by traditional peoples and communities. We collected their recommendations and knowledge of case studies to enrich the content of the guide. Our goal is to share what we learned about the strengthening of businesses of traditional people and communities, and encourage replication of our work. With that in mind, this guide brings together key guidelines using non-technical language and includes extensive references for further study on the subject. Amazonian fruit collected in the IL Surui. This guide was created in the scope of the "Biocultural Conservation of the Amazon Rainforest - Preventing Deforestation in the Karib and Mondé-Kawahiba Ethno-environmental Corridors" project, as part of the Amazon Corridors Initiative (ICA), thanks to the support of the Skoll and Avina Foundations and in collaboration with Equipe de Conservação da Amazônia (ECAM), Instituto de Conservação e Desenvolvimento Sustentável da Amazônia (IDESAM), Associação de Defesa Etnoambiental Kanindé and Associação Metareilá do Povo Indígena Suruí (Gamebey). Please, click here to download our guide (in Portuguese); here to learn more about the workshop; and here for more information about our project.